Aardwolf RPG is a unique and free text based roleplaying game. Aardwolf is based in the fantasy world of Andolor where magic is common and there are hundreds of exotic realms to explore, puzzles to solve and quests to complete. Aardwolf features a realistic game world with multiple continents and real geography. Each area includes a real time line-of-sight overhead map to see other characters and points of interest around you. Create your character from any one of 28 classes including fighter classes such as Soldiers, Knights, Hunters, Barbarians, Rangers, Archers, Assassins and Paladins or select a magic based class including Elementalists, Necromancers, Healers, Priests, Witches and Enchanters. Once you have choosen your race, your guild and your profession then the rest is up to you. You have absolute control over your character's actions and there are many ways to play Aardwolf. You can play the game solo or group with other players, focus on gaining experience and levels, take part in hundreds of quests, solve puzzles, explore, map, play casino games for in-game currency, join a clan, take part in our forums, enchant and craft equipment, compete with other players in player-vs-player combat and global quests, answer trivia, create your own private manor, experiment with hundreds of spells and skills and even, eventually, build your own additions to the world. If you have never played a text based RPG before, we offer an extensive in-game help system to help you get started and a team of volunteer "helpers" who answer questions in real time. We also have a very detailed starting area called "The Aylorian Academy" - your first major quest in the game where you are guided through playing Aardwolf in an interactive format. To learn more about MUDs in general, see the introduction to MUDs article. To jump in and get started, visit the "Play now" page to choose from a selection of online and downloadable clients. 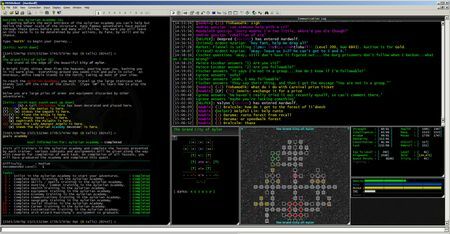 For builders, Aardwolf features an embedded LUA interpreter allowing area developers to add atmosphere to their areas and create area puzzles and quests. See our building section for more information on the LUA integration. If you already have a MUD client, you can connect to Aardwolf using aardwolf.org (23.111.136.202) port 4000. You can also use port 23 if you have a firewall blocking port 4000. To reach our Java client, click 'Play Aardwolf' in the link above. If you have problems connecting, feel free to mail webmaster@aardmud.org for help.